Upgrade to a First-Class Valentines! Not only on Valentines, Monday the 14th but also this weekend on Sunday the 13th, we are presenting a $30 Gift Certificate to Lottinvilles Woodgrill to our guests at the Arcadian Inn along with our Valentine Package. Return from dinner at the beautiful Lottinvilles Woodgrill to your room softly lit with romantic music playing, rose petals strewn on your bed, a box of chocolates on your bed and a bottle of champagne chilled. Run your bath, enjoy your Valentine, cuddle in our luxury linens (don't forget to order a specialty pillow) and awake to a private candlelit breakfast delivered to your room. Breakfast can served in time for you to get to work but you really don't want to do that. 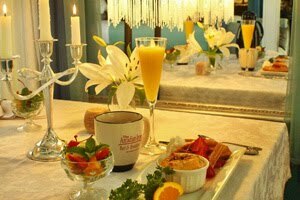 Mornings are glorious at the Arcadian Inn.